Drawing from an early Cornell year book. The first woman was admitted at Cornell in 1870, 2 years after the opening, at a time when few universities in the united states admitted women. Regular admission started two years later in 1872. The early mathematics faculty appear to have been strong supporters of women education. Mary Ellen Oliver, the sister of James Edward Oliver who was Chair of the department from 1874 to 1895, graduated from Cornell in 1878 with a Ph.B. Emma Sheffield Eastman was the first women to graduate from Cornell in 1873 (she earned a Ph.B.) The next year, she was teaching sciences and mathematics in High School in Portland, Maine. Cornelia Alice Preston graduated B.S. in 1874 and was teaching Higher Mathematics and History the next year in Utica. Both had attended Vassar College before enrolling at Cornell. After graduating with a Bachelor of Science and Letters in 1879, Lena Lillian Hill taught Mathematics and History at Omaha High School, 1879-84, and Mathematics in the Brearley School, New York City, 1884-5. In 1888, Mary Anna Widman received her Bachelor in Philosophy with Honor for a dissertation on "The projective treatment of conics". Between 1890 and 1895, Ida Metcalf, Anna Van Benschoten, Annie MacKinnon, Agnes Baxter and Leona May Pierce enrolled in advanced mathematics course at Cornell. They all eventually earned a Ph.D. in mathematics, the first four at Cornell and Pierce at Yale. Ida Metcalf (1893), Annie MacKinnon (1894) and Agnes Baxter (1895) were students of James Oliver. Of the 7 Ph.D.s in mathematics awarded at Cornell between before 1900, 3 were awarded to women.Women graduate students were offered university fellowships as early as 1888. 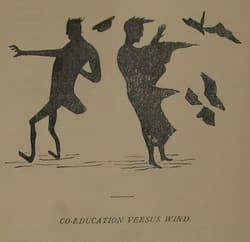 Nevertheless, coeducation was, for a very long time, far from equivalent to equality, especially as the place of women in the student body was concerned. Cornell was also slow to embrace the presence of women on its faculty in general. Owens is the first women to have been appointed as Instructor in the department (1917-1922). Born in 1881 in Kansas, Helen Brewster enrolled at the University of Kansas at sixteen. She earned a bachelor degree in 1900 and a master degree in 1901. In 1904, she married Frederick Owens, a fellow mathematics student at the University of Kansas. Their first daughter was born in 1905 in Chicago where Frederick was a graduate student and Helen taught at the Academy at Northwestern University and in high school in Evanston. In 1907 Frederick received his Ph.D. and accepted a position at Cornell where Helen enrolled as a graduate student. She was awarded her Ph.D. in 1910 for her dissertation, "Conjugate line congruences of the third order defined by a family of quadrics" which was supervised by V. Snyder. After receiving her Ph.D., she taught mathematics privately and at Wells College between 1910 and 1917. During her appointment at Cornell between 1917 and 1922 she taught such courses as Projective Geometry, Advanced Analytic Geometry and Differential Equations. In 1926, Frederick accepted the position of head of mathematics at Pennsylvania State College. From 1935 to 1938, Helen was associate editor of the American Mathematical Monthly. In 1940, Helen was hired as an Instructor at Pennsylvania State College and she was promoted to Assistant Professor in 1945 and retired in 1949. Throughout her life, she was very active in the battle for equal rights for women. She passed away in 1968 at the age of eighty-seven. Farnum received her undergraduate degree at the Iowa State College of Agriculture and Mechanic Arts in 1909. After teaching in various schools, she obtained a masters degree at Cornell in 1915 and was Instructor at Iowa State between 1915 and 1924. She was a charter member of the Mathematical Association of America. She spent two summers studying in Chicago before enrolling as a graduate student at Cornell 1924-1926. She was an instructor at Cornell in 1925-26 and obtained her Ph.D. "On Triadic Cremona Nets of Plane Curves" under V. Snyder that same year. She taught at NYU for many years before returning to Iowa State 1943-1949. She taught again at the University of Arizona 1955-57. She died in Tucson at the age of eighty eight in 1977. Christine Williams obtained her Ph.D. "A Theory of Normal Chains" at Yale under Reinhold Baer and Nathan Jacobson in 1947. She was appointed as Instructor at Cornell in 1947 and stayed until 1951. In 1951-52, she received an NSF fellowship and studied at Harvard. In 1966-67, she spent a year at the Institute of Advanced Study. Christine's husband, Raymond Ayoub was a fellow Canadian of Syrian origins who studied Mathematics at McGill, taking course form Lloyd Williams, Christine's father and a former Cornell faculty. Raymond obtained his Ph.D. at the University of Illinois in 1950. He and Christine married shortly after and Raymond was a Peirce Instructor at Harvard until 1952 when they both accepted Assistant Professor positions at Pennsylvania State University. They remained at Penn State for the rest of their careers. Raymond passed away in 2013 and Christine is Professor Emerita at Pennsylvania State University. Born in Vienna in 1924, Lisl (Novak) Gaal graduated from Hunter College and received her Ph.D. in 1948 at Harvard (Ratcliff College) with a dissertation, "On the consistency of Goedel's axioms for class and set theory relative to a weaker set of axioms," under Lynn Loomis and Willard Van Quine. In 1953, Lisl and her then husband, mathematician Steven (Istvan) Gaal, both accepted positions as Instructors at Cornell. They were promoted to Assistant Professors the next year and Lisl became the first women to receive this title in the department. At Cornell, Lisl supervised the 1956 Ph.D. thesis of Angelo Margaris "A Problem of Rosser and Trucquette in Many Valued Logic", the first Cornell mathematics doctorate directed by a women faculty. In 1957, Lisl and Steven left Cornell to take faculty positions at the University of Minnesota. Lisl is the author of the book "Classical Galois Theory: With Examples". She is Associate Professor Emerita at the University of Minnesota. Speh received her Ph.D., "Some Results on Principal Series of GL(n,R)" in 1977 at M.I.T. under Bertram Kostant. She came to Cornell in 1980 as an Assistant Professor. She is the first women to be awarded tenure in the department (1983) and the first to be promoted to the rank of Professor (1989). She was a Sloan fellow in 1984 and received the Humboldt Research Award in 1996. She spoke at the 2006 International Congress of Mathematicians in Madrid in and she is a fellow of the American Mathematical Society. Vogtmann received her Ph.D. at Berkeley in 1977 under John Wagoner. After teaching at Michigan, Brandeis and Columbia, she became Assistant Professor at Cornell in 1985, Associate Professor in 1987, Professor in 1994 and the Goldwin Smith Professor of Mathematics in 2011. Since 2015, she is the Goldwin Smith Professor of Mathematics Emeritus at Cornell and Professor of Mathematics at the University of Warwick, UK. She spoke at the 2006 International Congress of Mathematicians in Madrid. She is a fellow of the American Mathematical Society and has received numerous distinctions including the 2014 Humboldt Research Prize. Peeva received her Ph.D. at Brandeis University in 1995 under David Eisenbud. After three years as a C.L.E. Moore Instructor at MIT, she joined Cornell as Assistant Professor in 1998 and was promoted to Associate Professor in 2003. She has been a Professor since 2009. She was a Sloan Fellow in 1999-2001, received a NSF Career award 2004-2009, and a Simons fellowship in 2012-13. She is a fellow of the American Mathematical Society and was an invited speaker at the 2015 Joint Mathematics Meeting (AMS-MAA). Holm received her Ph.D. at M.I.T. in 2002 under Victor Guillemin. She was an NSF posdoctoral fellow and Visiting Assistant Professor at Berkeley before joining Cornell as Assistant Professor in 2005. She was promoted to Associate Professor in 2009 and Professor in 2015. In 2013-14, she was awarded a Simons fellowship as well as a von Neumann fellowship from the Institute of Advanced Study. She is a fellow of the American Mathematical Society. Meszaros received her Ph.D. in 2010 at M.I.T. under Richard Stanley. After spending time at Michigan and Cornell under an NSF fellowship, she became an Assistant Professor in 2014. Zakharevich received her Ph.D. in 2012 at M.I.T. under Michael Hopkins. She was a L. E. Dickson Instructor at the University of Chicago and a visiting member of the Institute for Advanced Study before accepting her present Assistant Professor position at Cornell in 2016.